Big unexplained holes have been opening in the ground everywhere. The Sprat list includes this strange phenomenon which has been making news because the holes that appear are damaging property, putting lives in danger, and in many cases, they remain a mystery. The latest sinkhole disaster has been occurring in Southern Louisiana. This began as an estimated 200 by 200-foot wide hole in the ground that swallowed cypress trees and open swampland near Bayou Come and Grand Bayou. Authorities last reported it to be expanding to nearly 500 feet in width and nearly that deep. It is filled with salt water and traces of diesel fuel and they worry that it is dangerously close from a cavern filled with butane. The National Guard was called to guard the area when Tropical Storm Isaac swept through the area. Two big sinkholes opened up in Brooklyn, New York this summer. One opened up under Seventy-Ninth Street in Bay Ridge and nearly swallowed a car. Nearby buildings appeared to be unaffected. But a super sinkhole earlier in June appeared at Ninety-Second Street and Third Avenue and the hole was estimated to be 70 feet deep. City work crews worked frantically to repair the damage, keep the holes from expanding to damage buildings, and to maintain underground gas lines and electric cables. The sinkholes were blamed from leaking century-old water lines. A hole appeared this summer in a football field at Verona High School, New Jersey. The hole opened into some kind of manmade structure that dropped about 15 feet. Historians say an old high school building once stood on the ground and then burned before the land was leveled and the property converted as a football field. In Tennessee, a sinkhole that opened up near Love Chapel Elementary school delayed the opening of school for 250 students. When the hole was first noticed on a Saturday it was relatively small in size. But it quickly expanded and was found to be 122 feet deep. The hole was filled with rocks in an attempt to stabilize the area and make it safe for the school. The local highway department reported that it took 61 truckloads to fill the hole. The City of Davenport, Iowa, has spent a million dollars this year to fill the repair the damage from an estimated 60 sinkholes caused by leaking water lines. The old water pipes are an estimated 100 years old. In Seminole County, Florida, a sinkhole opened under a house in Lake Mary. The hole was only five feet deep, but it forced the family of five to abandon the home. Local officials are concerned that the hole might still get deeper and wider before it’s over. Sinkholes have been opening on property occupied by a casino in Elko, Nevada, causing the management to excavate the area to find out the cause. Discovered under the ground were the remains of numerous old buildings that once stood there and were demolished in 1965. The debris was left in place and covered with dirt. A sinkhole just opened up in Santa Cruz, California, after the coast was buffeted by high wind and waves. Shoreline erosion is blamed. The United States isn’t the only place suffering from unexpected sinkholes. When the ground opened up to a 33-foot deep sinkhole in Harbin, China this year, it swallowed four people including a 14-month-old baby girl who was last seen in the arms of her aunt just moments before the collapse. Rescue workers scrambled and managed to rescue the baby and one other person. The other two perished. What began as a small sinkhole that opened in the back yard of a house in Butte, Montana, is now expanding to not only devour the yard but claim the house as well. Occupant Charlene Preston said at first it took only a few shovels full of dirt to fill the hold. Then it took wheelbarrows of dirt. Now the hole has expanded to a point where the walls of the house are cracking. To date, nobody knows what is causing the sinkhole or how deep it is going to get. 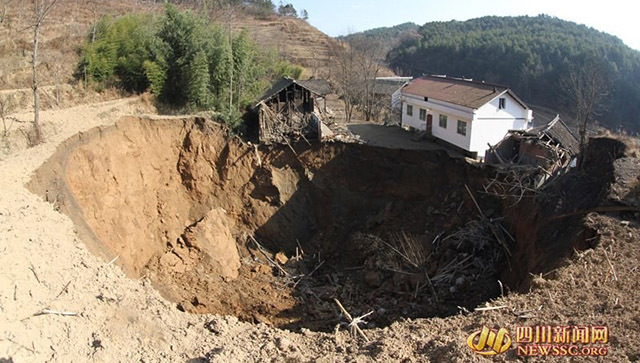 There are some massive sinkholes around the world that have made headlines. The Qattara west of Cairo, Egypt, is believed to be the largest natural sinkhole in the world. This sludge-filled quicksand pit measures 282,460 feet in length and 3,937,000 feet in width. It is estimated to drop over 436,000 feet into the earth. There numerous natural sinkholes of this kind in that area of the world, but the Qattara hole is the largest. A sinkhole that first appeared in 1986 at Berezniki, Russia, has been growing in size ever since. It is presently over 650,000 feet deep and measuring 260,000 by 130,000 feet in its massive size. Locals believe the hold is unstoppable. The sinkhole now threatens to cut off a rail line to one of the largest potash mines in the world. The hole that opened in the heart of Guatemala City in 2007 still leaves viewers shaking their heads. It just suddenly appeared, swallowing buildings, the street and killing two people. A thousand residents in the area had to be evacuated. The hold dropped about 30 stories into the earth. They said corroded sewer lines deep in the ground caused the sinkhole and the smells coming from the hole are terrible. In 1994 a 15-story, 2 million-cubic-foot sinkhole appeared below an 80-million-ton pile of gypsum, a toxic industrial waste. The hole contaminated 90 percent of Florida’s drinking water. Cleanup ran into the millions of dollars. Then there is the 400-foot-deep "Devil’s Sinkhole in Texas. It has been there so long that it was known to the Native Americans who considered it a sacred place. At Daisetta, Texas, a small 20-foot sinkhole in a residential neighborhood continued getting larger and larger. People said it spread by over 900 feet within a day, consuming telephone poles, buildings and cars. Even nearby oil drilling equipment nearby toppled into the pit. Yes Mr. Sprat, the sinkholes are opening under our feet. Most are caused by the aging water and sewer pipes that are leaking, causing underground caverns to open under the surface of the ground. We suspect the heavy use of underground water aquifers, crude oil pools and underground mining may also be involved in the sudden collapsing of the ground. Whatever the reason, the sinkholes appear to be getting more and more common all over the world. It is unnerving to have the ground we live and walk on suddenly disappear into a black hole.